That place…is Paul Nelson Farm. Home to extraordinary wingshooting opportunities, let this special place become your home away from home. 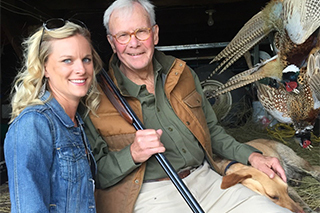 With unrivaled hunting, legendary lodging and an uncommon passion for genial hospitality, the Paul Nelson Farm experience is one like no other. It is a place…for all to gather. A place for families, friends, business colleagues and corporate retreats. It is a place where guests end up returning at a remarkable rate of 98%. The soul behind this statistic is the Nelson family. It is their trademark touch that transcends all other hunting lodge adventures. Most of all, it is a place brimming with world-class hunting and hospitality like nowhere else in the world. Here you’ll experience pheasants flushed by the hundreds, across patchwork fields beneath an endless Dakota sky. Here you’ll experience that easy banter with friends and family, forging a bond like no other sporting activity on earth. And that bond is only strengthened at hunt’s end. Because of course, the end of the hunt is no end at all to the PNF experience. Instead, the hospitality of the lodge beckons and begins. “We want you to be extraordinarily comfortable,” are the time-honored words of Paul Nelson. And you will be. Just another day, another trip, to a place like nowhere else in the world. Welcome to Paul Nelson Farm.